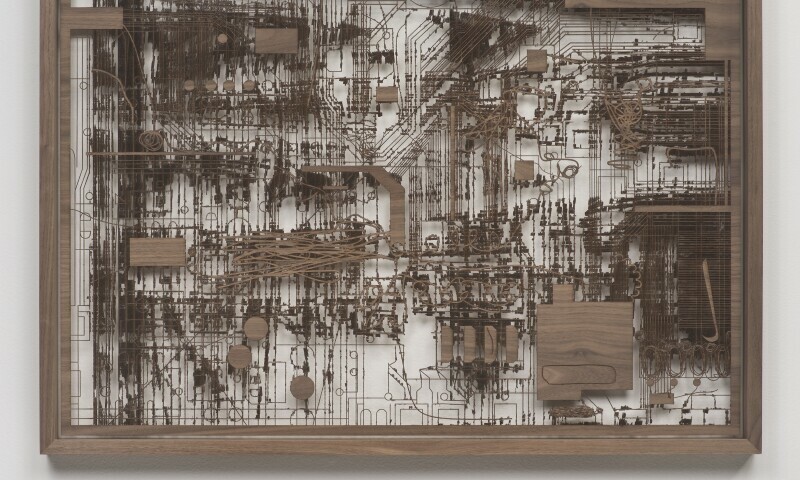 Analia Saban, Walnut Wood Circuit Board #1, 2013. Laser sculpted wood, 24 3/4 x 35 1/2 x 2 in. Saban also uses paint as a sculptural element to explore the physical properties and boundaries of the medium. For her FOCUS exhibition, Saban presents all-new works, including tapestries and paintings based on the geometric patterns of computer circuitry. In the Tapestry series, she uses a traditional loom to interlace linen with nontraditional weaving materials, such as dried paint and copper wire, to reveal a motif based on the matrixes of specific circuit boards that revolutionized computer technology. Such work emphasizes a connection between digital and analogue methods of art production and underlines the tension, as well as interconnectedness, of the handmade and machine-made underpinnings that exist in our everyday surroundings. In her canvases, Saban also uses a loom to weave dried brushstrokes of acrylic paint within the linen’s wefts and warps, subverting the custom of paint on canvas to create works that hover between paintings and objects. Often engaging sculpture, painting, photography, printmaking, and textiles in a single piece or series, Saban blurs the distinctions between media, questioning the material and conceptual boundaries of an artwork while revitalizing the notion of what art, or the process of making art, can be.